“This is a visit that has no substance,” said Khalil Shikaki, a Palestinian pollster and political analyst. 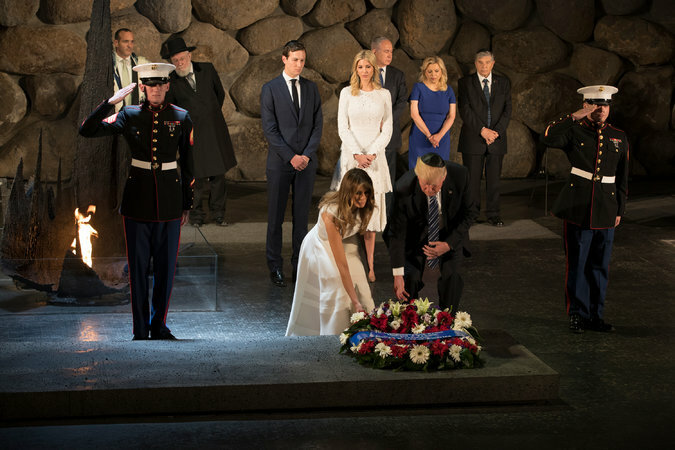 Mr. Trump and his wife, Melania, laid a wreath on Tuesday at the Yad Vashem Holocaust memorial in Jerusalem. That does not mean, he and others were quick to add, that the quick trip to Israel and the occupied territories, on Mr. Trump’s first foray abroad, was not useful in building bridges, in setting a different tone, in showing Israelis full support and Palestinians respect. Mr. Trump made clear that the new relationship Israel seeks with its Sunni Arab neighbors, some of whom he met earlier in Saudi Arabia, was linked to progress with the Palestinians. Mr. Trump seemed to accomplish all of this, most experts here agreed, with few of the missteps that have dogged him at home. Mr. Netanyahu, pressed by conservatives in his coalition, got much of what he wanted in a speech delivered Tuesday by Mr. Trump at the Israel Museum that adopted much of the prime minister’s own worldview of a dynamic, democratic Israel courageously defending itself against enemies like Iran. That prompted a standing ovation, and Mr. Netanyahu to shake his hand. Mr. Trump went on to note that Iran has committed itself to Israel’s destruction. “Not with Donald J. Trump, believe me,” he declared, and again the audience responded vigorously. And though the trip was largely focused on Israel, Mr. Abbas, struggling to maintain sway after years in power, got at least some of what he wanted as he hosted Mr. Trump in Bethlehem as a seeming equal. Mr. Trump’s trip and hourlong meeting with Mr. Abbas had all the pomp of a state visit — a quickly corrected public schedule from the White House even referred to “Palestine,” which many Israelis object to as a recognition of a Palestinian state — with little of the public chiding Israelis might have liked. New York Times journalists are answering readers’ questions about President Trump’s first trip abroad. He is visiting multiple cities in four countries: Saudi Arabia, Israel, Italy and Belgium. In the byzantine world of Middle East peacemaking, the White House calculation appears to be that lack of clarity may be a good thing at this early stage. Rather than pressure and dictate, the way they argue former Secretary of State John Kerry did during past failed peace efforts, Mr. Trump’s advisers said ambiguity leaves them room to maneuver. The question is whether the gauzy talk of hope and optimism can break through monstrously tall barriers to peace. Neither of Mr. Trump’s partners moved even an inch from their long-held positions and used their American guest in separate meetings to lash out at each other. Some analysts suspected that they simply told Mr. Trump what he wanted to hear about working for peace, smiled as they showed him to the door and sent him on his way while they returned to the status quo at home. But Isaac Herzog, the opposition leader and the head of the Labor Party, said that Jared Kushner, Mr. Trump’s son-in-law and adviser on the Middle East, told him that the United States intended to follow up quickly with a process moving toward an agreement. Israeli and Palestinian officials were mum about private talks. “Is anything behind all of this? That, only the prime minister knows,” said Mitchell Barak, an Israeli pollster and former political adviser. The cities Mr. Trump will visit and what events are planned. “Then he leaves it to Greenblatt, Freidman and Kushner and says, ‘Close it.’” Mr. Barak said, referring to Mr. Trump’s son-in-law and two of his private lawyers, Jason Greenblatt and David M. Friedman who he has made, respectively, his main envoy to the region and the American ambassador to Israel. Decades of American-led peacemaking has come to little when it comes to a deal with the Palestinians. But there is precedent for strict secrecy in the early stages, if that is what is happening. Israeli and Palestine Liberation Organization officials met secretly in hotel rooms and country estates and came up with the principles that led to the Oslo Accords in the early 1990s, with the Norwegians acting as a conduit. The Americans were not actively involved. The Israeli-Jordanian peace treaty signed in 1994 was also the culmination of decades of secret bilateral contacts. Mr. Trump’s speech at the Israel Museum was so friendly and considerate of Israeli emotions that one right-wing Israeli legislator described it as deeply expressive of the “Zionist narrative.” But some Israeli analysts say such a warm embrace can be conducive to building the trust necessary for a meaningful process. If there is any substance, secrecy may be all the more essential for Mr. Netanyahu because most of his current cabinet members oppose any far-reaching concessions to the Palestinians or the establishment of a Palestinian state. And several were gleeful that Mr. Trump pointedly avoided referring to a two-state solution that most of the prime minister’s allies oppose. “The president spoke about peace six times, and in all, he avoided supporting a Palestinian state, which would undoubtedly be an obstacle to achieving that goal,” said Naftali Bennett, Israel’s education minister, who advocates going so far as to annex areas of the West Bank. The president has backtracked on several issues that are key to Israel, including the location of the U.S. Embassy and settlement-building. By CAMILLA SCHICK and IAN FISHER on Publish Date May 22, 2017. Photo by Stephen Crowley/The New York Times.